❦INTERACTIVE ENTERTAINMENT: Usually, we don\'t have a lot of time to play with our cat during the day. Luckily, with the Collapsible Pet 3-Way Cat Tunnel, our kitty can entertain himself for hours! 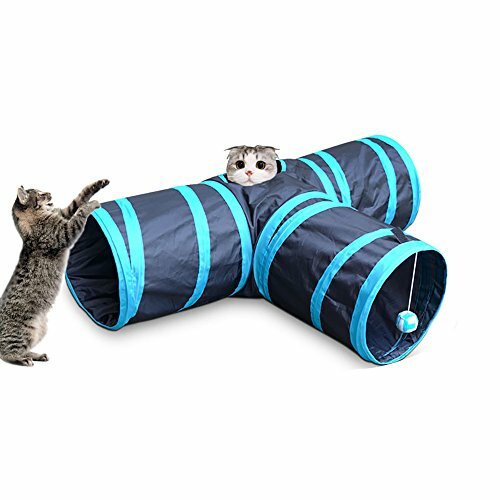 This Unique Toy is three Spacious Tunnels in One, giving your cat more room to roam, pounce, and hide than other single tunnels. ❦EASY TO STORAGE AND CLEAN: You will love that it is machine washable, easy to wipe clean and collapsible; so it is simple to store away when not in use. ❦PERFECT SIZE: 82x53x25cm Perfect for all small pets, including: rabbits, ferrets, guinea pigs and small puppies and kittens. ❦LOVE OF PETS: Pets will love playing in this tunnel, running back and forth, exploring, having their own hiding place and shade from the sun. ❦A GREAT Christmas or Birthday GIFT for FOR ALL PETS LOVERS!